In eighteenth-century Britain, venereal disease was everywhere and nowhere: while physicians and commentators believed the condition to be widespread, it remained shrouded in secrecy, and was often represented using slang, symbolism, and wordplay. 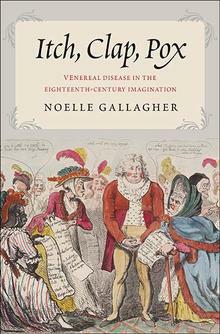 In this book, literary critic Noelle Gallagher explores the cultural significance of the “clap” (gonorrhea), the “pox” (syphilis), and the “itch” (genital scabies) for the development of eighteenth-century British literature and art. As a condition both represented through metaphors and used as a metaphor, venereal disease provided a vehicle for the discussion of cultural anxieties about gender, race, commerce, and immigration. Gallagher highlights four key concepts associated with venereal disease, demonstrating how infection’s symbolic potency was enhanced by its links to elite masculinity, prostitution, foreignness, and facial deformities. Casting light where the sun rarely shines, this study will fascinate anyone interested in the history of literature, art, medicine, and sexuality. Noelle Gallagher is Senior Lecturer in Eighteenth-Century Literature and Culture at the University of Manchester. She is the author of Historical Literatures: Writing About the Past in England, 1600-1740.